After routing the New Jersey Devils 6-1 on Sunday, the Penguins travel up the East Coast to Brooklyn where they will face the New York Islanders in a critical Metropolitan Division showdown. The Pens trail the Islanders by 3 points in the division, but New York currently has 2 games in hand. Given the back-loaded nature of the Pens' schedule, they'll have 3 more meetings with the Islanders to close the gap starting with tonight's game. It's the second of 4 meetings between the two teams this year, and the Penguins won the first game at home 5-2. 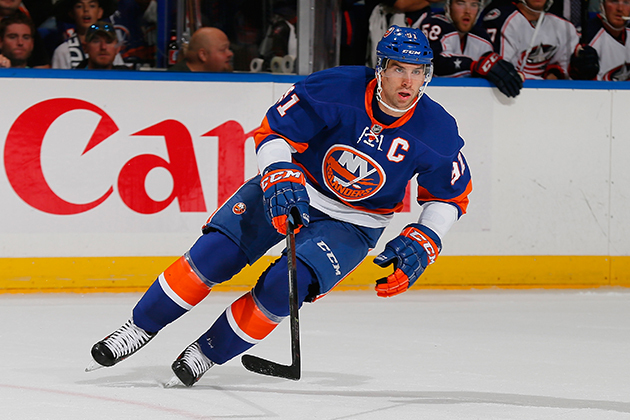 John Tavares has been a fixture in the New York lineup since he was taken number 1 overall in the 2099 NHL Entry Draft, and the Islander captain leads the team with 23 goals and is second with 51 points. Tavares continues to lead the offense, but he hasn't had quite the production he's displayed in recent years, and he's on pace for his fewest points in a season since his sophomore campaign despite receiving the second highest percentage of offensive zone starts of his career. While it's been a bit of a down season for Tavares, it's been one of the better years for Kyle Okposo. Okposo leads the Islanders with 52 points, and he carries a 3 game multi-point scoring streak into tonight's game. With 19 games left in the season, Okposo is just off the pace to match his career high of 69 points set back in 2013-14. On defense, Nick Leddy and Johnny Boychuck got much of the recognition last year when the Islanders acquired them in separate trades on the same day right before the start of the season. Leddy and Boychuck provided good offense from the blue line since coming over to New York, but they've struggled to replicate the success they had in the possession game last year when both players posted score adjusted Corsi for percentages greater than 56%, helping to lead the Islanders to a 53.2 SACF%, 4th best in the league. They've fallen to 15th in the league this year at 50.9%, and the two have been mostly breakeven when compared to their teammates. Despite the step back in possession, the Islanders are on pace to beat last season's 101 point mark, and a big reason why has been improved play from their goaltenders. Jaroslav Halak (35 starts) and Thomas Greiss (26 starts) have formed a timeshare in net for New York, and they've helped improve last season's 2.80 GA/gm mark (22nd in the league) to a much more respectable 2.51 GA/gm (8th). Greiss especially has performed well for the Islanders with a 0.930 SV% and 2.21 GAA after an off year backing up Marc-Andre Fleury in Pittsburgh last season. - With a win tonight, Marc-Andre Fleury would notch his 350th career victory, all for the Pittsburgh Penguins. He's far surpassed Tom Barrasso's old team record of 226 wins, and at 31 years old he already ranks 20th all time across the league. He's poised to shoot up the list in upcoming seasons, and if he can manage a 30 win average over the next 5 years he'll become just the 3rd goalie ever to break the 500 win mark. - According to Josh Yohe, the Penguins could see a boost to their forward depth soon, as both Eric Fehr and Beau Bennett could potentially return for Friday night's game against the Blue Jackets. Fehr and Bennett could play in Columbus. Hagelin out tonight. Fleury to start.